December 23, 2014 -- A beeping radiation dose monitor that is worn by healthcare personnel during cardiac catheterization procedures successfully reduced dose in a trial conducted by Texas researchers. Called Bleeper Sv, the monitor emits a warning sound that becomes louder and more frequent as exposure to radiation grows -- giving personnel a chance to modify their work habits to reduce dose. Healthcare's growing awareness of the risks of radiation exposure has led to a variety of solutions for reducing dose to both patients and medical staff. One of the biggest challenges is the very nature of radiation, as it's an invisible, silent phenomenon that offers no inherent warning if exposure grows from safe limits to dangerous levels. The Bleeper Sv device. Image courtesy of Vertec. Medical dosimetry badges worn by personnel provide some protection, but these are typically limited to providing data on cumulative exposure over time and are usually reviewed after the fact, rather than during procedures. The occupational dose limit for radiation exposure is 20 mSv per year for five years, and previous studies have indicated that personnel who are chronically exposed to radiation in cardiac cath labs are more likely to develop left-sided brain tumors. 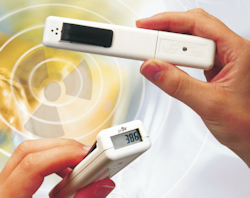 The small Bleeper Sv device offers a different take on dose monitoring. Marketed by U.K. radiation monitoring device developer Vertec, Bleeper Sv emits a beeping sound every 15 minutes in response to low background radiation. The device beeps every 20 seconds if radiation levels are higher, and it emits a continuous tone if radiation levels are very high. Researchers from the University of Texas (UT) Southwestern Medical Center decided to test Bleeper Sv's potential for reducing radiation dose among healthcare personnel in the facility's cardiac catheterization lab. Called the Radiation Reduction During Cardiac Catheterization Using Real-Time Monitoring (RadiCure) study, they published their findings in the December issue of Circulation: Cardiovascular Interventions (Vol. 7:6, pp. 744-750). 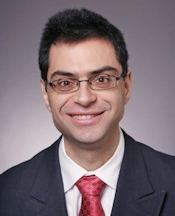 A team led by senior author Dr. Emmanouil Brilakis, PhD, associate professor of internal medicine at UT Southwestern, started with a population of 505 patients scheduled to undergo coronary angiography, percutaneous coronary intervention (PCI), or both. The patients were randomized into two groups: For the control group, healthcare personnel wore standard dosimetry badges, while staff in the other group wore Bleeper Sv. Senior author Dr. Emmanouil Brilakis, PhD. Personnel in the Bleeper Sv group wore the device in the chest pocket outside their lead aprons, in addition to standard radiation protection gear. Procedures were performed on two cardiac cath systems, one capable of fluoroscopy at 7.5 frames per second and the other at 15 frames per second. Procedures were performed by a group of 18 operators, consisting of 16 fellows and two attending physicians; studies had both a first and second operator of the equipment. The mean age of the patient population was 65 years (± 8 years) and 99% were men. Some 64% of the procedures were diagnostic coronary angiograms, 25% were diagnostic angiograms combined with PCI, and 11% were exclusively PCI. Median procedure time was 17 minutes for diagnostic angiography, 42 minutes for PCI, and 27 minutes overall. Procedure time was similar between the control and Bleeper Sv groups. The researchers found that dose was 36% lower for first operators in the Bleeper Sv group compared with the control group, at an average radiation dose of 9 microsieverts (µSv) versus 14 µSv (p < 0.001). The lower dose was applicable across patient subgroups, including procedure type and patient characteristics such as body mass index. Radiation dose was also lower among second operators, with an average reduction of 29%. In the Bleeper Sv group, second operators had an average dose of 5 µSv, compared with 7 µSv in the control group. The lower dose was seen in both diagnostic coronary angiography studies and percutaneous coronary interventions. In their analysis of the results, the RadiCure researchers said the Bleeper Sv device gave equipment operators real-time visualization of radiation exposure, enabling them to modify their behavior in response to the feedback provided by the device. In the RadiCure study, the most common change was to reposition the angiography system's image intensifier, putting it closer to the patient and at a less extreme angle, and also to optimize the position of shields in the room, according to Brilakis. The researchers were already using the lowest possible frame rates in exams, and the effect of Bleeper Sv was consistent whether fluoroscopy was done at 7.5 frames or 15 frames per second. Bleeper Sv use did not result in a statistically significant difference in patient radiation dose, as the study was underpowered to detect impact on patients. Some of the behavior modifications that resulted from Bleeper Sv feedback mostly affect operator dose rather than patient dose, the researchers noted. The group is planning a follow-up study, RadiCure II, which will have enough statistical power to detect whether Bleeper Sv can reduce radiation dose in patients. One downside to the device is that it beeps frequently in procedures on very obese patients, "which can be annoying," Brilakis said, and in some instances the devices were turned off. No patients complained about the beeping, although most were under moderate sedation. UT Southwestern personnel continue to use Bleeper Sv, which was selected for the trial because the researchers felt it was the most user-friendly and useful device they tested (the researchers have no financial ties to the device's manufacturer, according to Brilakis). The device is used on a daily basis, he said.